All you have to do is "Add" these events to your calendar and you'll get a handy-dandy reminder that day to ABORT ALL PLANS to go anywhere near the scene of the crime. Event. Whatever. AVOID MOSCONE Stay away from all of the streets surrounding the Moscone Center during Game Developers Week. The nerds are here and they want their revenge. AVOID MOSCONE Moscone Convention Center Stay away from all of the streets surrounding the Moscone Center during Game Developers Week. The nerds are here and they want their revenge. AVOID CHINATOWN Today's the day of the Chinese New Year Parade -- here's the exact route just in case. Streets will be closed beginning at 4pm. AVOID CHINATOWN Chinatown Today's the day of the Chinese New Year Parade -- here's the exact route just in case. Streets will be closed beginning at 4pm. AVOID CITY HALL During the Saint Patrick's Day Parade, drink your green beer in a local bar and stay far, far, far, far, far, far, far, far, far, far, FAR away from Market St and City Hall. AVOID CITY HALL City Hall During the Saint Patrick's Day Parade, drink your green beer in a local bar and stay far, far, far, far, far, far, far, far, far, far, FAR away from Market St and City Hall. AVOID UNION Where there're two bunnies, there're a thousand bunnies. 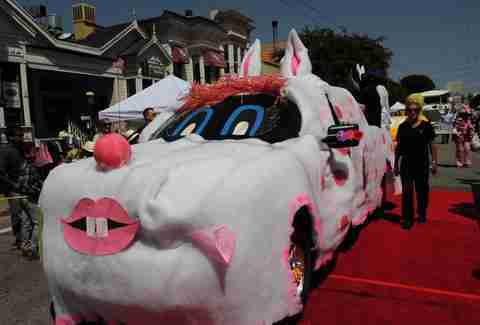 To keep away from the Union Street Easter Parade, avoid Union St from Gough to Fillmore from 10am to 5pm. AVOID UNION Union St Where there're two bunnies, there're a thousand bunnies. To keep away from the Union Street Easter Parade, avoid Union St from Gough to Fillmore from 10am to 5pm. AVOID JAPANTOWN During the Cherry Blossom Festival, Post St between Laguna and Fillmore Streets will be jam-packed with people who love a free festival. AVOID JAPANTOWN Japantown During the Cherry Blossom Festival, Post St between Laguna and Fillmore Streets will be jam-packed with people who love a free festival. AVOID SOMA Unless you're going to a Giants game, you basically don't want to be anywhere near AT&T during any of their 81 home games. Putting all of them on your calendar is up to you. AVOID SOMA AT&T Park/SOMA Unless you're going to a Giants game, you basically don't want to be anywhere near AT&T during any of their 81 home games. Putting all of them on your calendar is up to you. AVOID JAPANTOWN AGAIN Because one weekend just wasn’t enough for the Cherry Blossom Festival, you’ll want to avoid Post St between Laguna and Fillmore Streets. AGAIN. AVOID JAPANTOWN AGAIN Japantown Because one weekend just wasn’t enough for the Cherry Blossom Festival, you’ll want to avoid Post St between Laguna and Fillmore Streets. AGAIN. AVOID EVERYWHERE Either stay inside or go out of town, because the intoxicated foot race that is Bay to Breakers goes from the Embarcadero, along the Panhandle, through Golden Gate Park, and ends at the Great Highway. AVOID EVERYWHERE The entire middle section of SF Either stay inside or go out of town, because the intoxicated foot race that is Bay to Breakers goes from the Embarcadero, along the Panhandle, through Golden Gate Park, and ends at the Great Highway. AVOID SOMA It's AdTech time. Don’t go near the Moscone Center unless you want to get cornered by a VP of Marketing who’s just dying to tell you about how he can totally optimize that digital strategy across a multichannel OMG no just stay away. AVOID SOMA Moscone Convention Center It's AdTech time. Don’t go near the Moscone Center unless you want to get cornered by a VP of Marketing who’s just dying to tell you about how he can totally optimize that digital strategy across a multichannel OMG no just stay away. AVOID THE MISSION Unless you want to be a part of the Carnaval Celebration, you're gonna want to avoid The Mission for the entire weekend. AVOID THE MISSION The Mission Unless you want to be a part of the Carnaval Celebration, you're gonna want to avoid The Mission for the entire weekend. AVOID COW HOLLOW They say the Union Street Festival only goes from 10am to 6pm, but this party on Union St from Gough to Steiner is known to get sloppy and last (in the bars) well into the night. AVOID COW HOLLOW Union St They say the Union Street Festival only goes from 10am to 6pm, but this party on Union St from Gough to Steiner is known to get sloppy and last (in the bars) well into the night. AVOID SOMA WWDC is FIVE STRAIGHT DAYS of developers hanging out in and around the Moscone Center. No no no. AVOID SOMA Moscone Convention Center WWDC is FIVE STRAIGHT DAYS of developers hanging out in and around the Moscone Center. No no no. AVOID NORTH BEACH The North Beach Festival means that all of North Beach will be total mayhem from 10am to 6pm and likely well into the night. Avoid. AVOID NORTH BEACH North Beach The North Beach Festival means that all of North Beach will be total mayhem from 10am to 6pm and likely well into the night. Avoid. AVOID HAIGHT The Haight Street Fair will close down the street from Masonic to Stanyan so stay far away. Although you should really avoid Haight St on the weekends anyway. 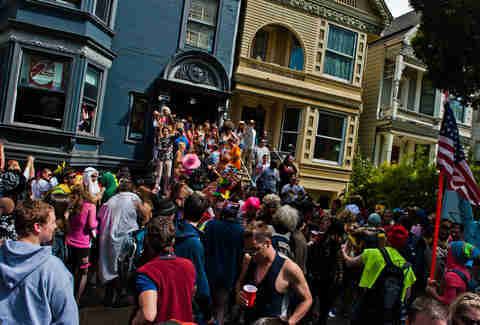 AVOID HAIGHT Haight St The Haight Street Fair will close down the street from Masonic to Stanyan so stay far away. Although you should really avoid Haight St on the weekends anyway. AVOID DRIVING IN SF Places to avoid: Civic Center, The Castro, and definitely all of Market St during the SF Pride Parade starting at 10:30am on Sunday. AVOID DRIVING IN SF Civic Center, The Castro, Market St Places to avoid: Civic Center, The Castro, and definitely all of Market St during the SF Pride Parade starting at 10:30am on Sunday. AVOID THE FILLMO' Unless you love jazz and crowds, don’t go anywhere near Fillmore St between Jackson and Eddy from 10am to 6pm during the Jazz Festival. AVOID THE FILLMO' Fillmore St Unless you love jazz and crowds, don’t go anywhere near Fillmore St between Jackson and Eddy from 10am to 6pm during the Jazz Festival. 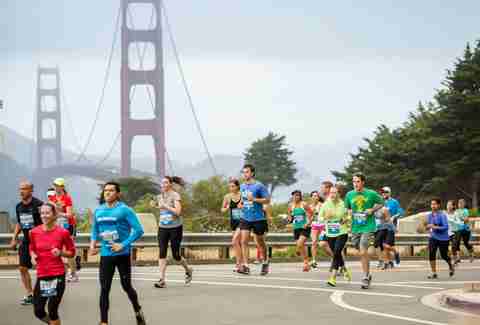 AVOID GOING ANYWHERE FOR BREAKFAST TODAY The good news is that you can probably sleep through the SF Marathon, but if you do find yourself awake at 5:30am, don’t go near the Embarcadero, Fisherman’s Wharf, the Marina, the Presidio, Golden Gate Park, Haight St, the Mission, or Potrero. No seriously, just stay in bed until noon. AVOID GOING ANYWHERE FOR BREAKFAST TODAY A loop around SF The good news is that you can probably sleep through the SF Marathon, but if you do find yourself awake at 5:30am, don’t go near the Embarcadero, Fisherman’s Wharf, the Marina, the Presidio, Golden Gate Park, Haight St, the Mission, or Potrero. No seriously, just stay in bed until noon. AVOID THE LEFT HALF OF SF Unless you're going to three-day-long Outside Lands, stay far, far away from Golden Gate Park and the streets that surround it on both sides. 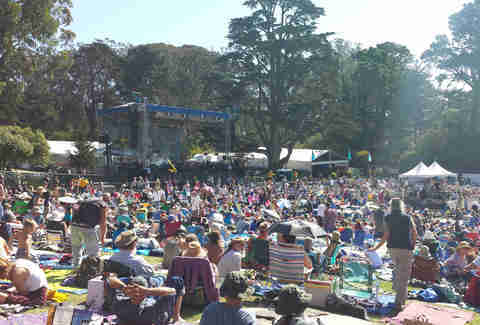 AVOID THE LEFT HALF OF SF Golden Gate Park Unless you're going to three-day-long Outside Lands, stay far, far away from Golden Gate Park and the streets that surround it on both sides. 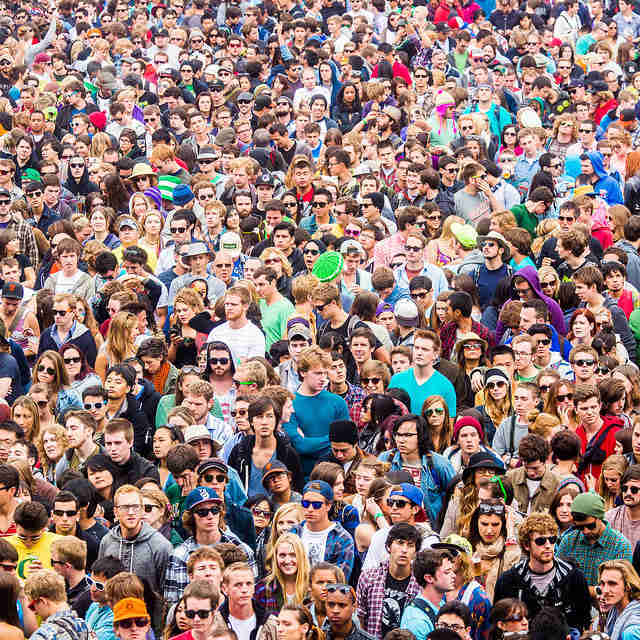 AVOID SOMA Do you want to be trampled by more than 140,000 people who consider themselves "industry visionaries?" Didn’t think so. 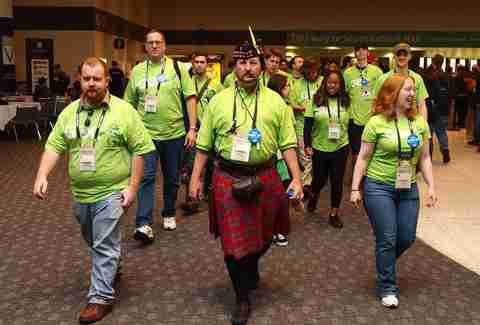 STAY AWAY from anywhere near the Moscone Center during Dreamforce. 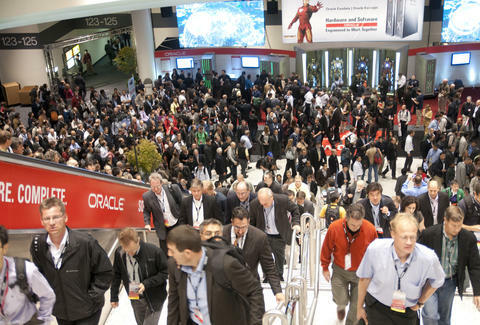 AVOID SOMA Moscone Convention Center Do you want to be trampled by more than 140,000 people who consider themselves "industry visionaries?" Didn’t think so. STAY AWAY from anywhere near the Moscone Center during Dreamforce. AVOID FOLSOM The Folsom Street Fair (on Folsom from 8th to 13th) will be nothing but nekkid people and leather from 11am to 6pm. If that's not your thing, you should probably not go anywhere near there. AVOID FOLSOM Folsom St The Folsom Street Fair (on Folsom from 8th to 13th) will be nothing but nekkid people and leather from 11am to 6pm. If that's not your thing, you should probably not go anywhere near there. AVOID THE CASTRO Never ever go to the Castro on the first Sunday of October. Unless you enjoy all the happy people and rainbows at the Castro Street Fair. AVOID THE CASTRO The Castro Never ever go to the Castro on the first Sunday of October. Unless you enjoy all the happy people and rainbows at the Castro Street Fair. AVOID THE WATER You can’t stay inside for all of Fleet Week (can you? ), so mostly you’ll just want to avoid anything North-facing near the water on Saturday and Sunday. The air and the water. And also the land. AVOID THE WATER The air and the water. And also the land. You can’t stay inside for all of Fleet Week (can you? ), so mostly you’ll just want to avoid anything North-facing near the water on Saturday and Sunday. AVOID NORTH BEACH People will be marching and (probably) slurping down pasta from Fisherman’s Wharf to North Beach during the Italian Heritage Parade. Does that sound like something you want to be in the middle of? AVOID NORTH BEACH North Beach People will be marching and (probably) slurping down pasta from Fisherman’s Wharf to North Beach during the Italian Heritage Parade. Does that sound like something you want to be in the middle of? AVOID DOWNTOWN OpenWorld is really the worst of the worst. The streets shut down. "Cool" bands play that you can’t see. And it seriously attracts 60,000 people. Stay away from Downtown at all costs. 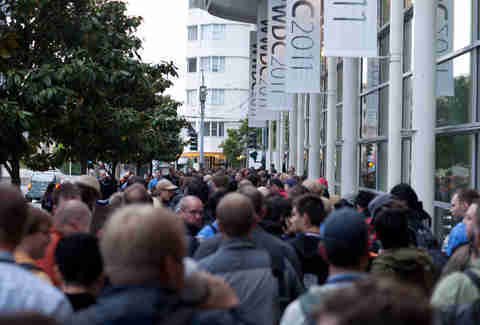 AVOID DOWNTOWN Moscone Center and surrounding streets OpenWorld is really the worst of the worst. The streets shut down. "Cool" bands play that you can’t see. And it seriously attracts 60,000 people. Stay away from Downtown at all costs. AVOID THE CASTRO On Halloween, all of SF will be a disaster, but especially The Castro. Everywhere. Even, probably, your front door. AVOID THE CASTRO Everywhere. Even, probably, your front door. On Halloween, all of SF will be a disaster, but especially The Castro. AVOID EVERYWHERE The official date of SantaCon hasn’t been announced yet, but it'll probably be on the 12th and the only way to avoid it is to hide in your home or get out of town. 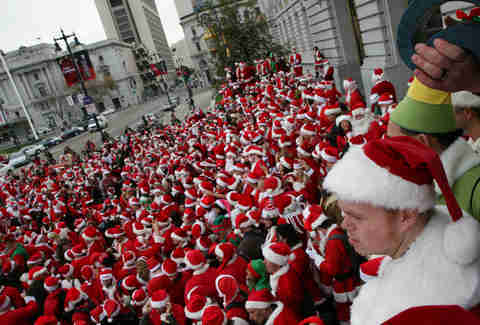 AVOID EVERYWHERE All over SF The official date of SantaCon hasn’t been announced yet, but it'll probably be on the 12th and the only way to avoid it is to hide in your home or get out of town.